I'd like to argue, but I can't muster the strength. My throat is dry and it hurts to breathe. Tears won't come. Shouldn't there be tears? Nothing about me has ever been right. I have done all I could to be complacent on this floating city, and still I've been restless. I've taken all the right pills and said the right things, and I have never been satisfied. "Even if we do make it to the ground," I say, "who's to say it's any better? What if there's a king no less corrupt than ours? Or what if the ground is just another city floating over an even bigger one, and so on?" "Then at least we'll be wiser," she says. "I'd rather be disappointed than oblivious." "Yesterday you were just a sweet schoolgirl," Pen says. "Now everyone wants you dead. I'm a little jealous of your intrigue." "They want you dead, too," I remind her. 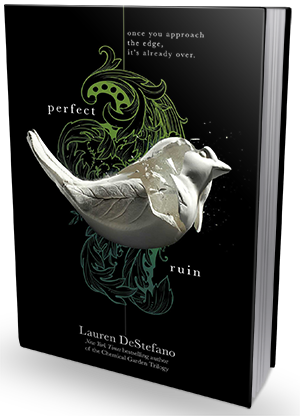 Prior to reading Perfect Ruin, I hadn't been exposed Lauren DeStefano. I've had The Chemical Garden Trilogy on my TBR for a while, but the cover Perfect Ruin, and its sequel Burning Kingdom, caught my eye. Of course the synopsis and rave reviews helped as well. Morgan is dissatisfied with her life on Internment, but seeing as they live on a floating island, there aren't many options to branch out. Plus, dreaming of the ground is a good way to be declared "irrational" and placed under permanent house arrest. She follows the rules and keeps her thoughts about the ground to herself, especially since her brother is a jumper (an individual who has attempted to jump over the side of Internment) and being related to a jumper already comes with its own stigma. Lauren has created a rather interesting world. People get pregnant when they're allowed (after waiting years in a queue), they are betrothed since before birth and if they're betrothed dies, well that's that for living life with another. And the fun part? Once you reached 75, that's it. You are, essentially, euthanized because you're no longer useful to those around you. Nice, right? I cannot imagine why anyone would want to leave . . .
We're introduced to a wide variety of characters - Morgan, her betrothed Basil, her brother Liam and his wife Alice, her best friend Pen and her betrothed Thomas, her parents, and others that if I were to mention would lead to some spoilers. The nice thing about this wide arrange of characters, is you see how wonderful Lauren is at creating them. None of them are similar, they don't blend together where you're trying to remember who did/said what. They have their own personalities, and even though some of them are secondary, they stand apart from the crowd and one another. There is also a range of romantic couples as well, which makes sense since you're betrothed (basically) at conception. I have a hard time believing all these betrothed couples are happy, but if you don't have a choice, I guess you learn to live with it? Also, we're only seeing them from Morgan's eyes, so we see what she sees and we have no idea what these relationships are truly like. The first half of the book is a bit slow: We are introduced to the world of Internment and all it's craziness, the characters and their dynamics, and learn some major secrets certain characters have been hiding. The unfortunate part is that, it's not until the last few chapters that the plot truly picks up. It's not the the first half drags, it's just slow and took me a bit longer than usual to get through. Of course, with the way it ended, I have the feeling that Burning Kingdom will start off with more momentum than Perfect Ruin.